If you have read my blog, then you know I am a huge fan of masks. I think they make a wonderful addition to the skincare routine. With masks you can do specialized treatments that you cannot do with other products. Masks help to clear out pores, brighten skin, exfoliate, and help with uneven skin tone not to mention also helping with fine lines and wrinkles. The blissworld mighty marshmallow bright & radiant whipped mask leaves skin looking brighter, with a more even skin tone, less dead skin dulling skin cells, and lightens up uneven skin tone so that your skin looks beautiful again. Marshmallow Root Extract delivers a surge of hydration to balance skin and prevent dullness and dehydration. A powerhouse blend of Vitamin C packs a triple threat against uneven skin tone with ascorbic acid and potent Vitamin C derivatives. Olive Leaf Extract is rich in anti-oxidants, it hydrates skin leaving it noticeably plumper and also helps to limit water loss from the skin. A lime, lemon, pine and eucalyptus oil blend of purifying and herbal oils acts a a natural toner to help removes toxins that can weigh skin down. Zinc PCA is known to help reduce excess oil while calming redness. This mask does not contain any parabens, phthalates, sodium laureth sulfate, SLES, and is cruelty free. To use: smooth a thick layer onto clean, dry skin. Avoid the eye area. Leave on for 10-15 minutes. Rinse thoroughly. Use 2-3 times per week if you have normal to combination skin. Dry skin use no more than 3x per week. Oily skin can use 3x per week. I would not recommend this for acneic skins. This mask helped to lighten my uneven skin tone, evening it out. It also brightened up my skin, helping to take away hyperpigmentation. I love the way it makes skin smoother and softer, letting it feel amazing. It looks amazing too. If I am going to go out without makeup, this is the mask I want to use beforehand. This mask gives an eternal glow to the skin that you just cannot get from washing alone. 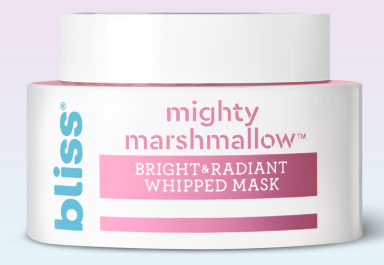 blissworld mighty marshmallow bright & radiant whipped mask retails for $15.00 per 1.7 fl.oz./50mL. It can be purchased online at www.blissworld.com or at Target or Kohl's stores. Like Bliss World on Facebook.com: https://www.facebook.com/BlissSpa; Follow Bliss World on Twitter:@blissspa; Follow Bliss World on Pinterest: https://www.pinterest.com/blissspa/ and Follow Bliss World on Instagram: https://www.instagram.com/bliss_spa/.